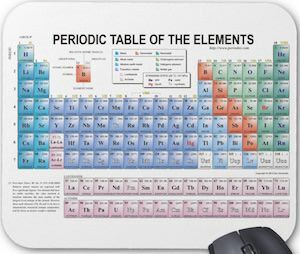 If you are looking for a new mousepad and would like the periodic table of the elements on your desk then you have to check out this periodic table mousepad. The mousepad is 9.25 x 7.75 inches and has a nice nonslip back so that it says in place on your desk at the office or if you use it for gaming at home. A useful and maybe slightly nerdy mousepad like this will make you desk look more fun and a mousepad will make your mouse work so much better and makes it collect less dust. So come and get your own Periodic Table Mousepad.